The 2016 racing season is officially history, and for us at Pink Gorilla Events it was just that, a history making year. In 2016, we topped 20,000 annual runners for the first time, received local & national recognition, and raised over $65,000 for nearly 100 local groups affiliated with our events. As race directors, we often forgot to look back at the fun and unique experiences we love creating for our fellow runners. Instead, we tend to always look ahead to what’s next, diving into making improvements for the next event or the following year. While meeting as a team to discuss our 2017 events I had an epiphany, we had a killer 2016! Not only was it a record breaking year for our company, full of sold out races, but we also had over a $6 million estimated economic impact on local economies, all-while providing a platform for fun, competitive and even life changing experiences all through running (as was apparent through our Halfsy Heroes Campaign)! Sure, there were long hours of planning, organizing and planning some more; Along with the occasional mistake along the way, even so it was a killer year! For me, numbers talk. So here is a fun look back at some of the numbers it took to Produce Big Experiences For Runners in 2016. 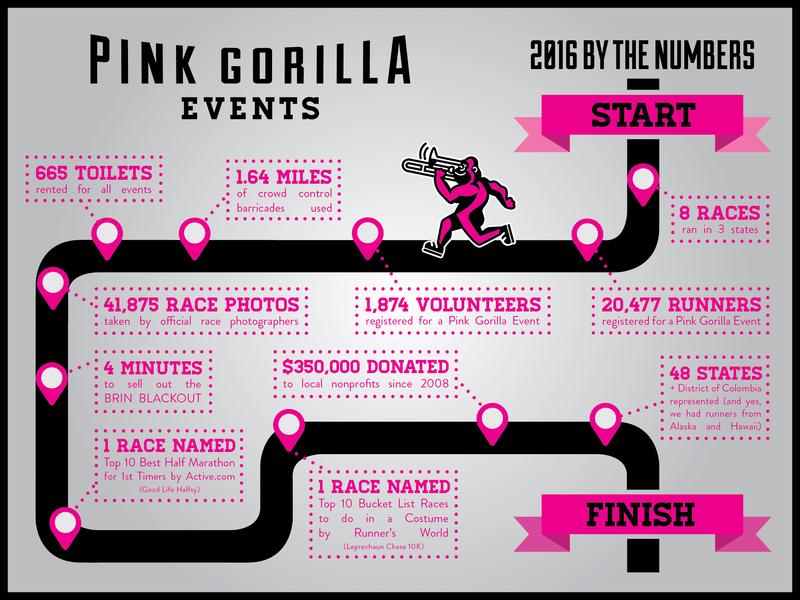 In 2016, Pink Gorilla Events produced 8 races in 3 states with 20,477 registered runners from 48 states, and worked with 1,874 volunteers to make these events possible. All 8 races sold out, including the BRIN BLACKOUT in just 4 minutes (whew!). There were 41,875 race photos captured by our photographers. We used 1.64 miles of crowd control fencing and rented 665 portable toilets (That’s a LOT of nervous bladders). We had two races (Good Life Halfsy + Leprechaun Chase 10K) recognized by national publications (Active.com and Runner’s World) and received local recognition by the Lincoln Chamber of Commerce with our Tourism Development Award, and had 3 of our team members named as Lincoln’s Most Influential Young Professionals by the Lincoln Journal Star. Of all the numbers to come from 2016, our team is most proud of 350,000; the amount of money we have helped raise for local groups since our first event in 2008! Thank you for being a part of this success! None of this would be possible without the support of those local groups, loyal runners, or our amazing sponsors. So thank you to everyone who had a role in making 2016 one for the history books. We look forward to an even more exciting 2017! Happy New Year and happy running from all of us! Sponsor – Our events translate into killer, customized sponsorship opportunities. And we are excited to talk to you! We pride ourselves on producing big experiences for runners and sponsors alike. Please contact zach@pinkgorillaevents.com to begin that conversation.